SSCC01, approximatly 1/8" (~3 mm) wide. 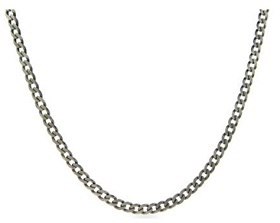 is standard endless curb chain used for neclaces including "Dog Tags". Please choose required length: 24" (61 cm) or 30" (76 cm). If you need custom length, please, email your request.